Great tragedies have their own naming conventions. When our shorthand term for a disaster is based on time—9/11, the Boxing Day Tsunami—the horror acquires a life cycle, and we can think of the world before and after that moment. When it’s based upon a place, a perhaps more cruel result is that the location becomes frozen in time for those outside of it, and as years pass our imaginations still leap to a moment further and further away from, say, the Chernobyl or Hiroshima or Bhopal of today. On March 11, 2011, the fourth largest earthquake on record occurred off the north-eastern coast of Japan. The effects were so enormous as to permanently shift the earth’s axis, and a tsunami devastated many hundreds of kilometres of coastline and left more than 18,000 dead or missing. It also led to a catastrophic failure at a nuclear plant requiring the evacuation of a 20-kilometre area. All of this, to many in the West, is collectively termed “Fukushima.” It’s akin to describing the World Trade Centre attacks as “New York.” Or, rather, “North-Eastern US,” since the evacuation zone surrounding the two Fukushima nuclear plants occupied only a fraction of the total area affected by the disaster, yet the name expands the site to the entire prefecture it’s within and, worse, ignores the fact that other prefectures suffered as much carnage and ruin. It’s telling that two Japanese productions responding to the aftermath of the earthquake and tsunami don’t really make reference to the nuclear fallout. Both are by Japanese artists who don’t come from the affected regions, and both draw tense energies from the issues that raises: who has the right to speak of disasters, and what role art can play in the face of such real and widespread sadness? When the works played Melbourne recently, the sense of distance between stage and event was only amplified, but in ways that lead the mind to ponder that problem rather than paving over it with artifice or the placation of fiction. Hamanaka Company’s Kagerou: Study of Translating Performance puts the challenge of articulating another’s grief right there in its title. Creator Shun Hamanaka travelled to Hisanohama as a volunteer in the wake of the 2011 earthquake and has been returning since, working with locals in a wide variety of ways to document their experiences and help in rebuilding their community in ways less literal than ordinary infrastructure. The performance is based on interviews he conducted with a woman whose husband was lost in the tsunami. It’s a verbatim piece, with a single actor performing her words as their recorded version is fed to her via an earpiece (similar to the kind of process local artist Roslyn Oades has pushed in fascinating directions, though in this case much simpler in execution). Richly hued and at times painterly photographs from the town today are projected as her backdrop, providing a fine sense of the region as one that continues to live and grow, and not at all one frozen in time. When numbers relating to a disaster describe the dead or missing, it’s easy to collapse those categories—it seems profoundly unlikely that someone who went missing on March 11, 2011 will turn up alive today. But as Kagerou gently makes clear, the two are not the same for someone who has lost a loved one. The work’s narrator returns again and again to her need to find at least a bone, and this story squares with many reports describing similar experiences—of people who still comb the beaches today, or learn diving so they can seek for some proof of death on the sea floor. To call this a need for closure is too pat. During Kagerou, this proof of death feels more like the validation of a life. The title roughly translates as “mirage” and Hamanaka has spoken of how his time in the fishing village led to a moment when it almost appeared as if he could see the vanished town hovering over its broken foundations. The feeling the work produces is similar; we have been offered not a snapshot of a tragedy, but a glimpse of its echo, no more solid than the shimmering light off the harbour waters. 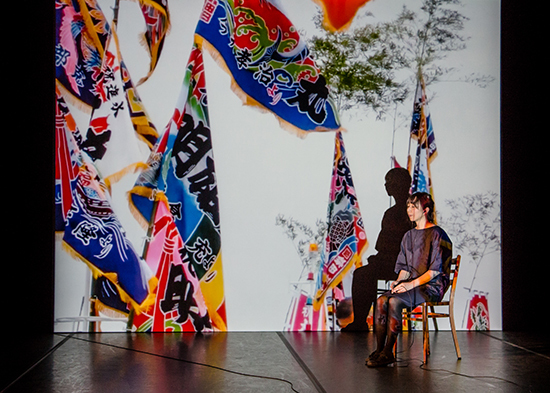 Shun Hamanaka’s background is as an architect and he has only recently begun working with performance. 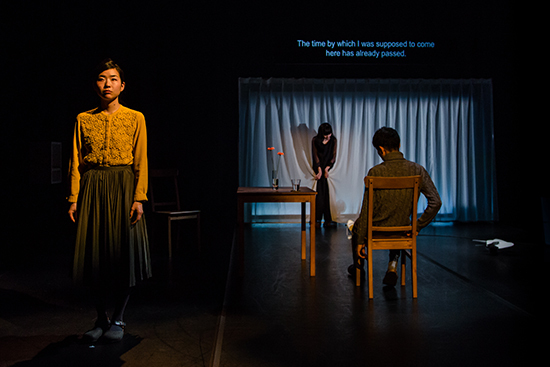 Tokyo-based company chelfitsch has a much more established performance history, its work, Time’s Journey Through a Room, building upon a gestural vocabulary that is quite distinctive. Director Toshiki Okada maintains a focus on small, even unconscious movements that are repeated to a point approaching choreography, and the relationship between inner states of being and bodily expression is given curious rendering as a result. The play’s conceit is simple: a man and a woman are in the first stages of a new relationship, but he is haunted by the ghost of his dead wife, who invisibly observes the action. What unfolds, however, is a more startling challenge to the ways we think about disaster. In the days following the East Japan earthquake, the then-living woman found herself in a state of unbounded joy and hope, as if the catastrophe were a reminder to live a better life. She died of unrelated causes shortly after, leaving her husband to make sense not only of his own grief but of the bizarre call to optimism in the aftermath of unimaginable disaster that his wife’s last days bequeathed him. The production is minimal, the set mostly composed of items whose functions are abstract: a subtly rippling curtain, a length of tubing occasionally pumping bubbles into a glass of water, a large, rolled-up sheet suggesting anything from a drum barrel to a tree trunk. As the work progresses there is a sense in which the furniture and the room itself are invested with some kind of life, a type of animism, and by its end we may be wondering whether the humans in this space are only half of the story—if we haven’t, in fact, been watching a room’s journey through time. All of this takes place a long way from Fukushima, or anywhere directly affected by the earthquake. Okada’s story is one of people responding at a distance, just as both he and his audience are. But his themes aren’t of respectful compassion or thoughts and prayers or any of the conventions of sympathy that circulate around disasters. He is confronting us with responses that are harder to process—perhaps selfish, perhaps perverse, perhaps useful, though it’s not clear when or to whom. In an odd way, a lot like grief.